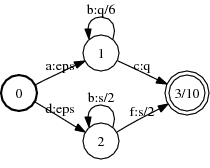 This operation produces an equivalent transducer by pushing the weights and/or the labels towards the initial state or toward the final states. 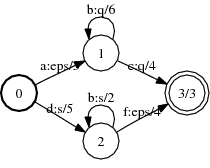 When pushing weights towards the initial state, the sum of the weight of the outgoing transitions and final weight at any non-initial state is equal to 1 in the resulting machine. When pushing weights towards the final states, the sum of the weight of the incoming transitions at any state is equal to 1. Weight needs to be left distributive when pushing towards the initial state and right distributive when pushing towards the final states. 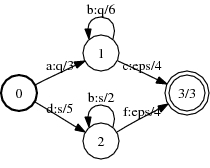 Pushing labels towards the initial state consists in minimizing at every state the length of the longest common prefix of the output labels of the outgoing paths. 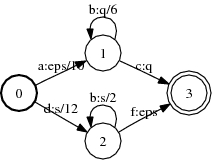 Pushing labels towards the final states consists in minimizing at every state the length of the longest common suffix of the output labels of the incoming paths.